Hattie’s Creative Arts is part of the Sept. 5 Summit Artwalk from 5 to 9 p.m. Hattie’s Creative Arts worked with the Akron Area Arts Alliance to develop the new 596 square-foot space on the third floor of the Summit Artspace building. Original works of art, ceramics and photography by people with disabilities will be on display at the Artwalk. Hattie’s Wearable Art line—art by people with developmental disabilities transposed onto scarves and neckties—will be available for purchase. The Artwalk features nearly two dozen destinations for art, shopping, dining and entertainment. Held on the first Saturday of the month, each Artwalk is a unique experience and wonderful opportunity to meet the downtown Akron artists. The city’s trolley service runs the entire route beginning at 5 p.m.
Hattie’s Creative Arts moved into the Summit Artspace in August. The program will provide art classes to members of the community with developmental disabilities. “We are proud to be part of such a vibrant ar t community with the Akron Area Arts Alliance and Summit Artspace,” said Phylliss Steiner, director of Hattie’s Creative Arts and media production. “The Akron Area Arts Alliance and Summit Artspace’s initiatives to integrate the community and include all Summit County residents in the arts is in-line with Hattie’s Creative Arts’ mission,” said Steiner. “Our mantra, ‘Art for Arts Sake’, will capture the very essence of all the sessions, exhibits and showcases Hattie’s Creative Arts can now provide in Summit County. 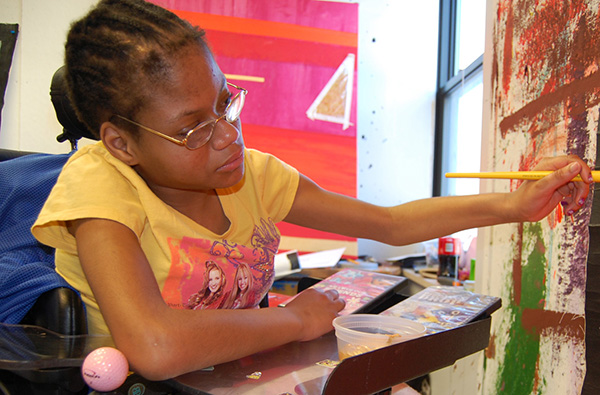 Hattie’s Creative Arts is an art program that empowers people with developmental disabilities to communicate through artistic expression. With the assistance of an art tracker, people with developmental disabilities paint, create ceramic pieces or take photographs. Proceeds from sold artwork go to the artists. The Summit Artspace is located at 140 E. Market St. in Akron. For more information contact Phylliss Steiner at (330) 274-2272, ext. 3013.